Hero Motocorp entered Colombia by forming a wholly owned subsidiary under the name Hero Motocorp Ltd. Colombia SAS (HMCL Colombia SAS). Mr.Pawan Munjal, Managing Director & Chief Executive Officer, Hero MotoCorp Ltd, has laid the foundation stone for a full fledged manufacturing plant at Villa Rica, Colombia. The plant will have an annual production capacity of 78,000 units and is expected to go on stream towards the middle of the FY2016. The capacity can be expanded to 150,000 units in the future. The facility will be spread over 17 acres. 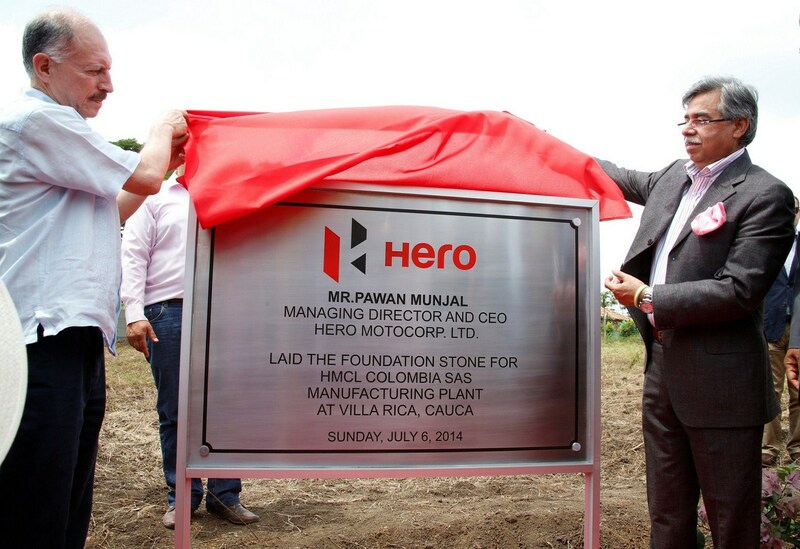 Hero Motocorp's CEO Pawan Munjal lays the foundation stone for the Colombian manufacturing plant in Villa Rica. Hero Motocorp has announced that it will invest USD 70 million/INR 419.2 crore (capex of USD 38 million and the rest as working capital for the next three year period) in Colombia in the next 3-4 years. The local manufacturing operation is expected to create significant direct and indirect job opportunities in the country. Colombia is the 20th international market for Hero Motocorp which has presence in Asia, Africa, Southern and Central America. By 2020, the world's largest two wheeler maker aims to expand its global presence to 50 markets with manufacturing facilities in 20 countries. As far as financial targets are concerned, the company is looking to achieve an annual turnover of INR 60,000 crore by the end of this decade. Other international markets that are on Hero Motocorp's radar are US and Brazil.